Everyone is unique and we all need to embrace what makes us different and special. A customer called me looking for a gift for a little girl, something she could grow with. 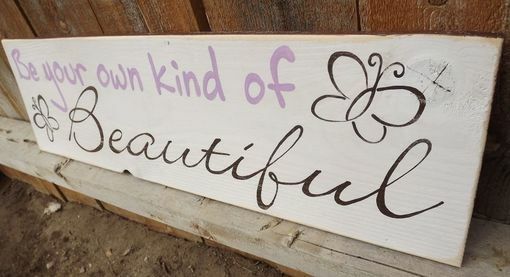 I love this saying for encouraging girls to be their own kind of beautiful. So I created this sign in ivory, pink and chocolate brown for her and they loved it. It arrives ready to hang. Hand painted and distressed. Made from pine wood and sealed for years of enjoyment.